I am alone. I am utterly alone. By the time you read this, I will be gone, having jumped having been so unable to contain my excitement about the news of a Beetlejuice sequel that my heart exploded and I am now stuck in the Netherworld Waiting Room, about to meet my caseworker. During a recent interview at Sundance, Winona Ryder, who played Lydia Deetz (quintessential goth girl icon) in the first Beetlejuice movie, told HuffPost Live! 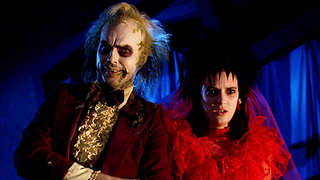 that Beetlejuice 2 is more than likely in the works. "As far as I know, it's going to happen," she said, possibly adding, "My whole life is a dark room. One big dark room." Sequels, of course, are a mixed bag...wherein most of the bag items are pieces of garbage. Taking a film as beloved as Beetlejuice and continuing the story could be an absolute disaster that ends up making a lot of fans and film geeks very angry. Then again, a Beetlejuice sequel could also mean the return of Catherine O'Hara as Delia Deetz and—with that in mind—the movie seems well worth the risk.